This recipe is best prepared on the stove top in a large soup pot. Even though this recipe is called autumn chowder, it is also great for any chilly day, and we first made this recipe in the spring. It is also great for leftovers, and can be stored in the covered pot in the refrigerator for a few days. 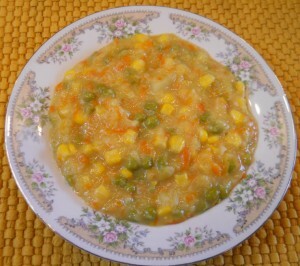 Place the frozen corn and peas into a large cooking pot on the stovetop, and add about a quart of water to cover the vegetables. Turn the heat on to high simmer. Wash and clean the cabbage, carrots and onions, and peel the carrots and onions. For this recipe, we finely shred the veggies in our food processor and add them to the pot. However, the veggies can also be diced. Wash and clean the potatoes, and peel if desired (retain one medium sized potato for later addition). Slice the potatoes, cut into small cubes, and add to the cooking pot. Add water to just cover all the vegetables when they are pushed down with a spoon. Cook until the water begins to boil, and then reduce the heat to simmer until the potatoes and veggies are tender. Mix occasionally.